Frantz company has offered an extensive line of bagged absorbents since the early '50's. Our all-purpose floor absorbents economically keep floors clean, dry and safe. We've offered an extensive line of bagged absorbents since the early '50's. Used to soak up liquids from water to oil, Frantz absorbents are available in a range of prices and absorption capacities. This all-purpose floor absorbent keeps floors clean, safe and dry. High absorbency - despite its tremendous oil absorption capacity, Oil-Zorb retains its hard, granular shape ... even in heavy traffic, even when fully saturated. Oil-Zorb can be reused again and again until it's completely saturated. Low dust levels - Powdery fines have been removed from Oil-Zorb so it's virtually dustless right from the bag. Economy - Oil-Zorb cleans oily, greasy floors while it serves as a safe walking surface. And it's easy to spread and sweep up for reuse. Safety - Non-combustible Oil-Zorb won't burn or smolder. 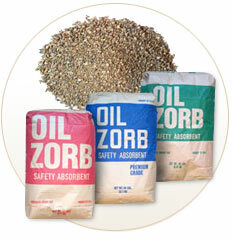 Minimal tracking - Oil-Zorb keeps oil and grease from being tracked into carpeted offices or other areas of the plant.